For ither uises, see Martorell (disambiguation). 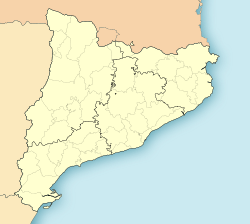 Martorell (Catalan pronunciation: [mərtuˈɾeʎ]) is a municipality that shapes pairt o the Baix Llobregat comarca, in Catalonie, Spain, primarily kent for its medieval Pont del Diable. It lees at the confluence o the Llobregat an Anoia rivers. It haes three railwey stations - ane on the RENFE line frae Manresa tae Sant Vicenç de Calders (via Barcelona an Vilafranca del Penedès) cried "Martorell", an three on the FGC line frae Barcelona tae Manresa cried "Martorell-Vila", "Martorell-Enllaç" an "Martorell-Central". Martorell is hame tae the SEAT corporate heidquairters an automobile factory, whaur the Audi Q3 is manufactured. ↑ "Legal Note." SEAT. Retrieved on 20 November 2012. "Autovía A-2, Km 585 – 08760 Martorell"
↑ "ESP BARCELONA - MARTORELL". This page wis last eeditit on 11 Mairch 2018, at 12:25.